I was thinking about making a 24GHz beacon... and having a few of these Elcom Synthesisers off ebay on the bench i wondered if it was possible to set them to greater than 12GHz to double up to 24.048GHz. 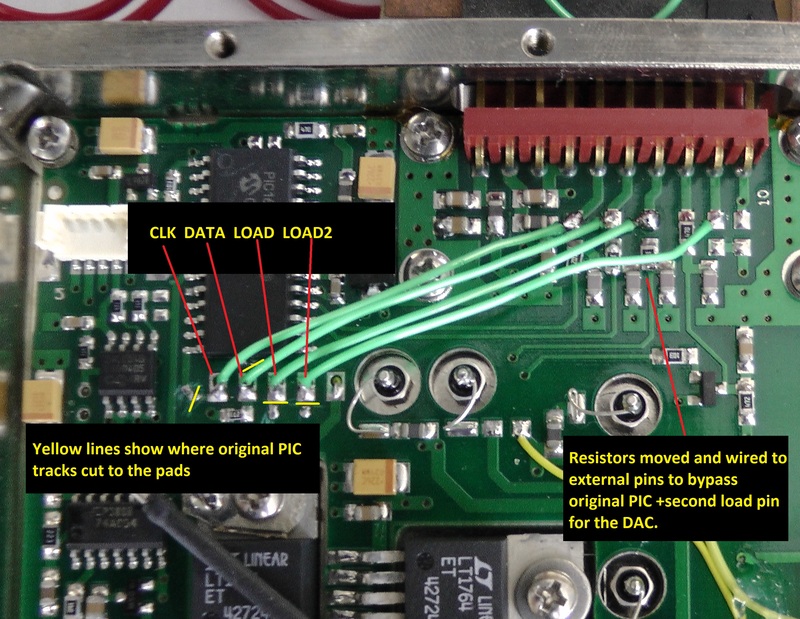 With the original G4FRE code and internal PIC controller in the Elcom Synth this was not possible, one has to directly talk to the PLL chip itself. After a lot of screws were removed from the Elcom unit!! (ILCDFSL-1201 11.2-12GHz) i found an ADF4252B PLL. The PLL works at the main VCO frequency at 2GHz then is multiplied and filtered at 5x VCO freq. An internal PIC micro controller interprets the frequency setting from the G4FRE code and configures the PLL. I probed the SPI for the original values (11.610GHz) and worked from there to create the Arduino code which bypasses the internal PIC and talks directly to the ADF4252. Depending on the PLL settings (i have zero experience here...) you can get nice small freq steps for other uses like a beacon so this is very useful! Actual step size depends how close to an integer step you are, you can play with the numbers in the excel sheet below to get an idea. I found that you need to keep the R divider as low as possible to keep the phase comparator frequency high otherwise the phase noise degrades quickly and the unit also fails to lock - probably related to the external loop filter components. My code below creates a signal at 12.024390GHz as a start for making a 24.048780GHz beacon, tone is nice, phase noise about -50dBc at 1KHz. If you want to use this like i did above 12GHz the output filter of the Elcom unit had to be trimmed slightly to get the power back up to ~12dBm. Use between the original freq range needs no mods to the RF sections, so no need to remove all those screws! I currently have the basis of my 24GHz beacon with PLL freq keying in CW using this setup, the PA module is unknown make 'tvc' but it appears to work well as a doubler and amplifier in one unit generating ~150mW of RF at 24GHz, how simple! So, the next job is to do the same for the DFS-1101 which uses the PMB2306T PLL - So far i have the module's RF arrangement figured out and the default register values so hopefully i can add the code to drive that soon too, i'm not sure whether it will be as useful as the ADF4251 as it is a much more basic pll device.